NEW HOPE, Pa., Dec. 21, 2017 /PRNewswire-USNewswire/ -- Injured veterans, including their friends and families, took full advantage of the opportunity to let their inner-child out to make new friends and play during the Christmas Festival at Peddler's Village. Wounded Warrior Project® (WWP) veterans and guests led the parade, which also featured a special visit from Santa and his elves. "I went to a strawberry festival at Peddler's Village a few months ago and loved it, so I decided to go to this Christmas festival and parade," said Army veteran Wayne Landry. "My family enjoyed it. My wife and I really enjoyed some quality time together shopping for Christmas deals and talking to other warriors in and around New Hope's beautifully decorated stores and craft stands." WWP program events, like this holiday festival, give wounded warriors an opportunity to experience veteran peer support firsthand. These social gatherings get them out of the house and connect them with fellow service members and their communities. During the event, veterans and their families were also able to learn about other WWP programs and services. WWP serves warriors by connecting them with one another and their communities and focusing on mental and physical health and wellness, financial wellness, independence, government relations, and community relations and partnerships. Generous donors make it possible for wounded warriors to take part in connection activities and benefit from program resources at no cost to them. "I always love attending these Wounded Warrior Project events," Wayne said, "because I get to meet fellow warriors, as well enjoy the events themselves. We met another family that lives in northern New Jersey. They were very friendly and our families got along really well." 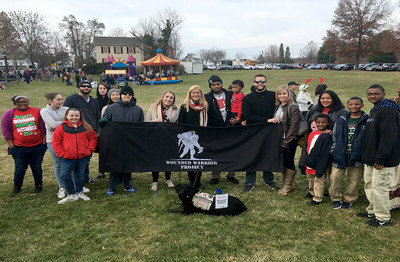 "Events like this parade and holiday festival provide a place for warriors to get together and enjoy the company and support of others, as well as knowing everyone appreciates our sacrifices," Wayne said.